When the I35 bridge collapsed last Thursday in Minnesota, the tragedy and its aftermath sent shockwaves through the country. The road and the bridge were built in 1967 at a time of massive growth in the numbers of automobiles owned by Americans. In the days following the bridge collapse, engineers and officials across the country have noted that many other bridges of similar age and design could present safety problems across the nation. Obviously, the National Highway Traffic Safety Administration will begin to take a more proactive role in assessing road standards, and states are going to be investing a lot of money into road maintenance, inspection and upgrades. But for those of us living in cities dependent on public transportation for our commuting needs, the lesson is the same. Too bad no one has mentioned it yet. The oldest parts of New York City’s subway system are over 100 years old. Even the newest parts of the IND lines are all around 70 years old. Outside of Manhattan much of our train system runs above ground. The Culver Viaduct over the Gowanus Canal is set to undergo a complete renovation; various parts of the elevated 7 tracks in Queens are on the MTA’s Capital Construction to-do list. But this is a short list of elevated parts of the subway dependent on aging infrastructure. The Broadway Bridge at the northern tip of Manhattan is from 1960. The elevated tracks at Yankee Stadium date from 1917. The list literally runs for miles and miles. For us in New York, as we debate ways to fund mass transit, ways to cover budget gaps, ways to build new subway lines and maintain old ones, the bridge in Minnesota should serve as a stark reminder to the age of our great subway system. At 100, the New York City subway is no baby. We need the money to maintain it; we need the money to keep old structures modern and sufficient for the demands of a very crowded subway that serves as the lifeblood of New York City. Now, with roads under the microscope, politicians may turn a little gung-ho in their efforts to inspect every roadway and bridge in the country. But the subways are just as important, and now is as good a time as any to remember that. 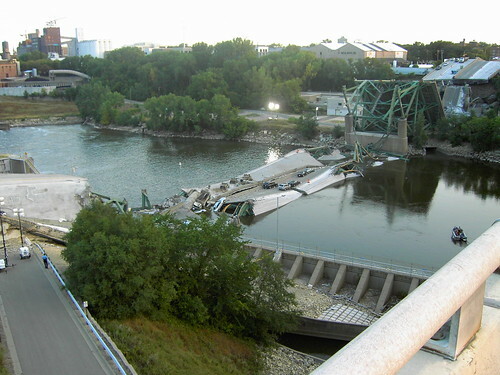 A subway bridge collapse would be just as tragic and shocking as the one in Minnesota. We can’t afford to see that happen. Heck, some northerly parts of the Park Avenue Tunnel (Metro North nee’ NY Central RR) date from the 1840’s! But of course, back then they built stuff to last for multiple millenia. I could not agree with you more. Even though I am not from New York, I have been there many times before and envied your public transportation system. Here is a short letter I have written on the subject of the bridge collapse. I personally believe that the infrastructure in the US has been detiorating for years. I do a fair amount of traveling around the US and every place I visit shows the signs of a country literally crumbling before our very eyes. Many of the bridges and roadways throughout America look as though they are near the breaking point. If you were to drive around the Portland Oregon area, and area which has many bridges, you will find many bridges that have restricted weight limits, and many do not allow any large trucks to pass at all. This is not unique to the Portland Oregon area; it is endemic throughout the country. I believe this is not just a problem of a lack of funding for the maintenance of our bridges, and infrastructure. On the contrary, I believe it is a problem in the how the United States infrastructure is laid out. We rely on and create an infrastructure that is based almost entirely around the automobile. The amount of money spent on the Freeway system in America is astronomical, and the cost of operating our automobiles and trucks increases every year. With the cost of oil and gas rising due to political and economic reasons, and our reliance on gas and oil as great as it is along with the consumption an reliance growing throughout the world, this cost will only continue to increase above and beyond the rate of inflation. Regardless of the political and economical forces that influence this increase, the cost of keeping up with building new roads, and maintaining the ones we already have, is going to grow beyond our ability to finance them. I am afraid that the political reaction to the bridge collapse in Minneapolis will be to throw more money at our one sided infrastructure. This will only continue to enforce our reliance on the automobile as our only source of transportation. There are two ways to solve the problem of our aging roadways and bridges and both of them need to be employed. We need to spend more money on alternative modes of transportation such as our railway systems, and on public transportation in general, along with our roadways. If we reduce the number of people on the roads it also reduces the amount of maintenance required. We need forward thinking politics not reactive political decisions. Panic is a great way to get a funding bill through congress but a horrible way to run a country. …But the subways are just as important, and now is as good a time as any to remember that. A subway bridge collapse would be just as tragic and shocking as the one in Minnesota. We can’t afford to see that happen.